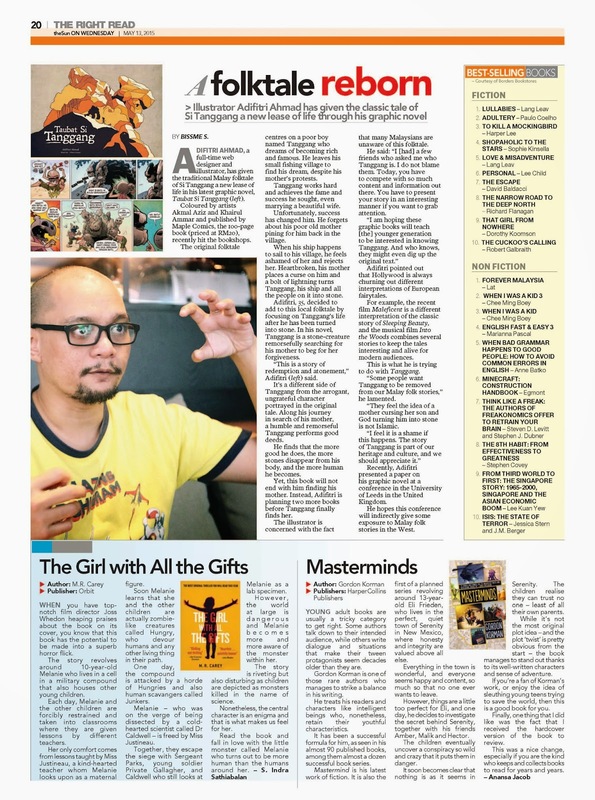 Adifitri Ahmad a full-time web designer and illustrator, has given the traditional Malay folktale of Si Tanggang a new lease of life in his latest graphic novel, Taubat Si Tanggang (left). Coloured by artists Akmal Aziz and Khairul Ammar and published by Maple Comics, the 100-page book (priced at RM20), recently hit the bookshops. places a curse on him and a bolt of lightning turns Tanggang, his ship and all the people on it into stone. Adifitri, 35, decided to add to this local folktale by focusing on Tanggang’s life after he has been turned into stone. In his novel, Tanggang is a stone-creature remorsefully searching for his mother to beg for her forgiveness. “This is a story of redemption and atonement,” Adifitri said. It’s a different side of Tanggang from the arrogant, ungrateful character portrayed in the original tale. Along his journey in search of his mother, a humble and remorseful Tanggang performs good deeds. He finds that the more good he does, the more stones disappear from his body, and the more human he becomes. Yet, this book will not end with him finding his mother. Instead, Adifitri is planning two more books before Tanggang finally finds her. The illustrator is concerned with the fact that many Malaysians are unaware of this folktale. He said: “I [had] a few friends who asked me who Tanggang is. I do not blame them. Today, you have to compete with so much content and i nformation out there. You have to present your story in an interesting manner if you want to grab attention. is trying to do with Tanggang. “Some people want Tanggang to be removed from our Malay folk stories,” he lamented. Recently, Adifitri presented a paper on his graphic novel at a conference in the U niversity of Leeds in the United Kingdom. He hopes this conference will indirectly give some exposure to Malay folk stories in the West.